Jain Heritage School has assembled the finest professionals. National and International coaches and instructional staff who possess an immense experience in their individual sports. has been the first Indian to win a Grandslam title in mixed doubles at France Open 1997 as coach of Mahesh Bhupati. 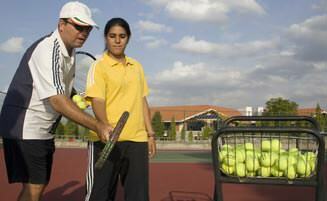 He has also been coach to Leander Peas, Sania Mirza and Women's Tennis Team at Doha Asian Games 2006. He has Ranked No 1 In India for five occasions In the eighties. At present he is the captain of Indian Federation Cup Team. is the founder of Match Point Table Tennis Academy, Bangalore. He is a former Indian International Table Tennis Player and a three time National Champion. He has more than 300 Championship medals to his credit and represented Karnataka State for 25 years besides being the captain of the state team for over a decade. Sri GK Vishwanath was the coach to the Indian Table Tennis Team to China and Korea following his appointment by the Table Tennis Federation. He is a former Indian Cricketer. He was a right handed batsman and right arm off break bowler. He was a key architect of Karnataka’s three Ranji Trophy triumphs in the 1990’s. He won the Man of the Series award on his debut one day international series against South Africa in the LG cup. Bharadwaj currently coaches Karnataka in Ranji Trophy. Nihar Started coaching in 1980, at a young age due to an exceptional swimming talent in the family. It was a huge challenge due to lack of experience and up to date coaching information available at the time. In 1989 travelled to the USA to attend ASCA conference in Pittsburg and do my level 3 physiology certification and was lucky to have Dr. Ernie Maglischo one of the world’s leading swimming physiologists, coach, author of the book Swimming Faster. In 1990 he travelled USA and worked with U.S Olympic coach Jack Nelson of the Fort Lauderdale Swim Team (FLST). He coached in the position of senior coach, Asst national team coach, Head masters coach and Head coach of the Jack Nelson Swim Camp till November 1993. He also worked on The Search Level 2 coaching manual which was used by the world Swimming Coaches Association (WSCA) for their certification programme in India. Started the K C Reddy Swim Centre in 1994 and developed it into one of the best known premier swim centres in India having developed every Olympian that has represented India in the last 10 years which include Nisha Millet, Hakimuddin H S, Shika Tandon, Rehan Poncha, Veerdhaval Khande and Sandeep Sejwal. In August 2010 started the Dolphin Aquatics. Kyoshi Praveen Ranka is a man that stands tall. He belives in the traditional methods of martial arts, but is able to wield the ethos of this sport into contemporary life. He has been training in martial arts since the age 14 under the Budokai Karate School and achieved Black Belt, the first in the state of Karnataka. After this initial training, to further hone his skills he trained under the great pioneer of Karate Late Dr. R.V.T Mani and other illustrious teachers of martial arts both national and international. He seems to embody the martial art principle that learning is an everyday process and cannot be taken for granted. Praveen Ranka more importantly has been working for the emancipation of Karate-Do by increasing the visibility of the sport through his programmes of introducing the martial arts-Karate-Do into the curriculum of schools in Bangalore, also inviting international experts for demonstrations and as acting faculty and also by organizing numerous state, national and international championships and tournaments. He has been working hard towards spreading the message that martial arts are not only about improving of physical skills ands techniques but also that it addresses areas of self control, meditation and concentration. These tools could enable a person to learn about his/her inner self, thus his teaching is that Karate-Do eventually becomes a way of life.